The recently discovered element 117 has been officially named "tennessine" in recognition of Tennessee's contributions to its discovery, including the efforts of the Department of Energy's Oak Ridge National Laboratory and its Tennessee collaborators at Vanderbilt University and the University of Tennessee. "The presence of tennessine on the Periodic Table is an affirmation of our state's standing in the international scientific community, including the facilities ORNL provides to that community as well as the knowledge and expertise of the laboratory's scientists and technicians," ORNL Director Thom Mason said. "The historic discovery of tennessine is emblematic of the contributions Tennessee institutions like Oak Ridge National Laboratory, the University of Tennessee and Vanderbilt University make toward a better world," Tennessee Gov. Bill Haslam said. "On behalf of all Tennesseans we thank this world body for honoring our state this way." The International Union of Pure and Applied Chemistry (IUPAC)—which validates the existence of newly discovered elements and approves their official names—gave its final approval to the name "tennessine" following a year-long process that began Dec. 30, 2015, when IUPAC and the International Union of Pure and Applied Physics announced verification of the existence of the superheavy element 117, more than five years after scientists first reported its discovery in April 2010. ORNL had several roles in the discovery, the most prominent being production of the radioisotope berkelium-249 for the search. The berkelium-249 used in the initial discovery and subsequent confirmatory experiments for element 117 was produced by ORNL and the Department of Energy's Isotope Program, and was provided as a U.S. contribution to those experiments. Superheavy elements, which do not occur naturally, are synthesized by exposing a radioisotope target to a beam of another specific isotope. In theory, the nuclei will in rare cases combine into a "superheavy" and heretofore unknown element. In tennessine's case, the atomic recipe for element 117 required the berkelium-249 target, which was available only from ORNL's High Flux Isotope Reactor (HFIR), which produces radioisotopes for industry and medicine in addition to its neutron scattering research mission, and the adjoining Radiochemical Engineering Development Center (REDC), where the radioisotopes are processed. Over a year-long campaign, ORNL produced and then shipped the 22 milligrams of berkeleium-249 to Russia, where the experiment that would yield element 117 was carried out with a heavy-ion cyclotron at Russia's Joint Institute for Nuclear Research (JINR) in Dubna. After six months of relentless bombardment with a calcium-48 beam, researchers had detected six atoms in which the nuclei of the calcium and berkelium had fused to create element 117. Subsequent experiments confirmed the results. "The discovery of tennessine is an example of the potential that can be realized when nations come together to lend their unique capabilities toward a scientific vision," said ORNL's Jim Roberto, who helped put together the element 117 U.S.-Russia collaboration with JINR's Yuri Oganessian. Beyond producing the necessary radioisotope, ORNL has a long history in nuclear physics research that enabled the laboratory to contribute knowledge from researchers experienced in nuclear physics and international collaboration and tools in the form of detectors, instruments and electronics. The lab also has a history of partnership in physics research with Vanderbilt University in Nashville, Tenn., which initiated discussions that led to the historic collaboration, and the University of Tennessee, Knoxville, which participated in experiments that confirmed the discovery. DOE's Lawrence Livermore National Laboratory in California rounded out the element 117 team. Livermore has an accomplished record in superheavy element research and is the namesake of livermorium (element 116). The specific spelling of tennessine was chosen because the new element is classified as a halogen, a type of element that by convention ends in the suffix "-ine." Halogens include elements such as chlorine and fluorine. 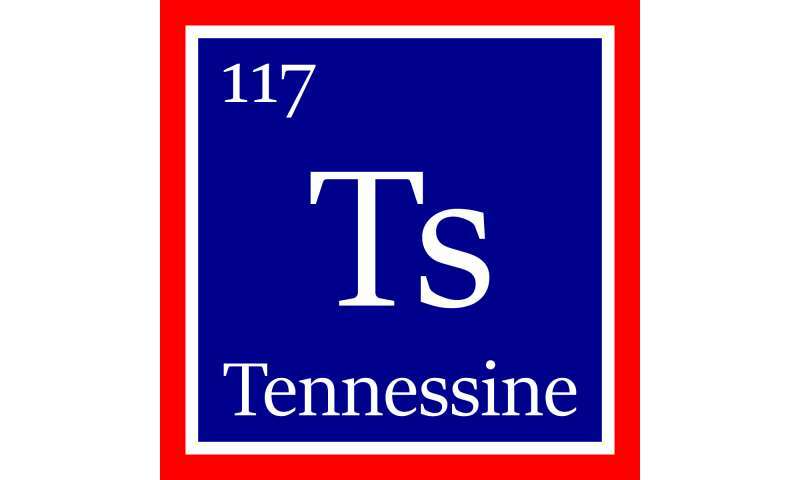 Tennessine's symbol on the Periodic Table will be Ts. Discoveries of new elements at ORNL began with the Manhattan Project. During World War II, researchers at ORNL's Graphite Reactor discovered promethium—element 61 on the Periodic Table. Because of the secrecy that enveloped the project to develop the first nuclear weapons, the discovery wasn't reported until after the war, in 1947. In addition to tennessine (element 117), ORNL-produced isotopes via the DOE Isotope Program have been used in the discoveries of superheavy elements 114, 115 and 118 through international collaborations. The discovery of superheavy elements, which typically exist for only fractions of seconds, is driven by a quest for the long-predicted "island of stability," in which new elements beyond the existing Periodic Table may survive for exceptionally long periods of time, opening up new and useful vistas of physics and chemistry. Still think they should have named it Spartanium, but I guess they just aren't into Halo.